Vaping is an alternative to smoking that has been around for a relatively short time. Until about ten years ago, vaping was virtually unknown. In fact, even today, many people, including smokers, remain in the dark on the difference between vaping and smoking, hence the need for this discussion. Nicotine which is absorbed in the brain within the first six seconds after inhalation. Prolonged use of nicotine affects the heart, arteries, and lungs. Carbon monoxide which reduces the amount of oxygen carried by the red blood cells. Hydrogen cyanide associated with seizures, irregular heartbeats, and headaches. Vegetable glycerin, also found in canned fruits, canned vegetables, yogurt and powdered milk. If you consider vaping vs. smoking regarding ingredients, cigarettes pose a more severe health threat to the user. When you light a cigarette stick, it produces smoke from the tobacco, its myriad of chemicals and paper. Also note that the cigarette paper is bleached using chemicals that may be harmful to health. As the cigarette burns, over four thousand chemicals are vaporized and inhaled into the body of the primary and secondary users. By contrast, e-cigs work by using e-juices which are prefilled in the cigarette and vaporize once the battery is activated. Research shows that this smoke is 95% less harmful than cigarette smoke. The smoke is also non-carcinogenic. Now the smell of cigarette smoke is offensively pungent and irritating to most people, especially the unfortunate ones who do not smoke or don't like the smoke. Not only that, but the stench lingers for minutes and also sticks to fingers, hair, and clothes of the user. In comparison of vaping vs. smoking, vaping only produces the pleasant scents of fruits, candy, and drinks. Besides this, the scent from e-cigs doesn't linger after use, and it is safe to use indoors or outdoors. Cigarette smoking negatively affects your oral health, leading to ugly looking stained teeth with yellowish discolorations. Tar and nicotine from cigarette smoking tend to settle on your teeth cavities and make their way up to the microscopic enamels of your teeth. Staining also occurs on the smoker’s fingers. On the other hand, vaping does not cause staining, regardless of the amount of vapor produced. Naturally, smoking is a dirty habit. 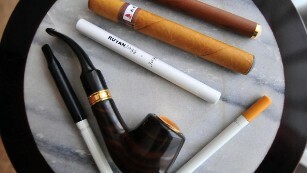 Having unattractive residue is unavoidable when you are a smoker. No matter how neat or clean a smoker may be, ash from the burnt cigarette will always be lying around somewhere around the house or office, and it can be off-putting. Electronic cigarettes do not leave behind any residue because nothing is burnt in the vaping process. Looking at vaping vs. smoking on the subject of secondary smokers (people who don't necessarily smoke but happen to inhale the smoke coming from a cigarette), smoking exposes everybody near the smoker to the serious health risks posed by the chemicals in cigarette smoke. In fact, the health risks posed are equal for both the primary and secondary smokers. On the other hand, vaping poses no health hazards to people close to the e-cigarette smoker. The primary concern about vaping is that the scent from the vapor may be alluring to children. When we compare the cost of vaping vs. smoking, it is evident that smoking is the more expensive habit. If you smoke a pack of cigarettes every day, it will cost you over $300 a month, depending on where you live. On the other hand, the price of an electronic cigarette will take you back $250 on average, after which your expenses will only comprise of bottle refills that cost as little as $1.33. In the long run, you will save money by vaping instead of smoking. You will also safeguard your health by foregoing the thousands of chemicals that smoking pumps into your body. How Much Paracetamol Is Fatal?